Is it really morning without eggs or some kind of breakfast meat cooking in a skillet? Well, yeah, probably for most of us. But there’s something special about that kind of situation happening on a lazy Sunday morning and for most of us, that’s totally doable. 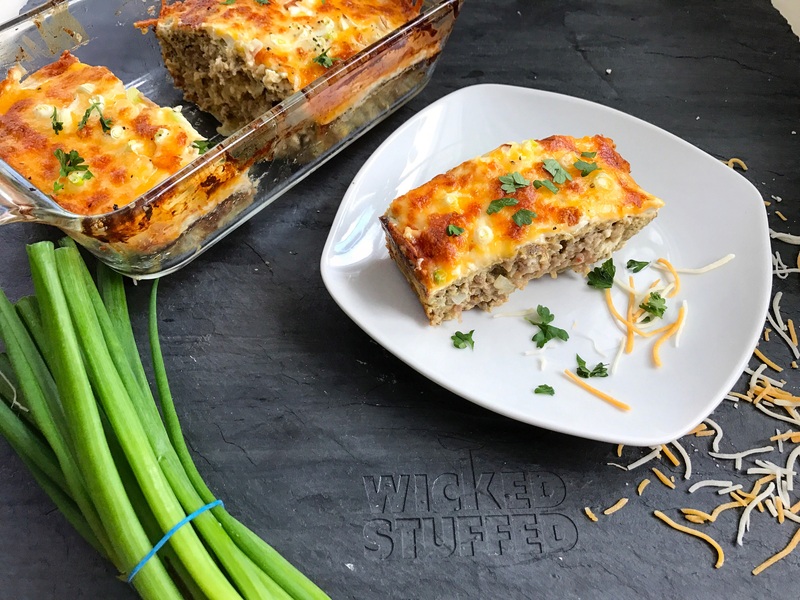 Over the last week or so I’ve gotten a couple emails from people who are loving The Wicked Good Ketogenic Diet Cookbook but who are utterly confused by the Morning Meatloaf recipe on page 47. Whoops. Sorry, pals! I know a lot of cooks would try to make you feel like a “recipe fail” is user-error, but this one is all me! This morning I re-made the recipe (which also should have called for two loaf pans instead of one) with no alteration other cutting the recipe in half and leaving out the extra instruction details that weren’t meant to apply. I’m re-publishing it here, halved because it’s exactly how I made it this morning and I don’t want anyone else to fail at this UTTERLY DELICIOUS recipe! I recommend a pre-seasoned bulk sausage like Jimmy Dean’s sage mix, which is low carb because it doesn’t have weird fillers. Grease small loaf pan with some ghee. Pour the meatloaf and egg mixture into the loaf pan. Add to the oven and bake, uncovered, about 30 minutes or until stiff. Spread the remaining cream cheese over the top of the meatloaf, then top it with cheddar cheese and scallions. Add the meatloaf back to the oven. Bake for about 5 more minutes, then switch to Broil for about 2-3 or until the cheddar cheese begins to golden and crisp . Remove from oven, and let your morning meatloaf sit for at least 5 minutes before slicing and serving. Bake for about 5 more minutes, then switch to Broil for about 2-3 or until the cheddar cheese begins to golden and crisp. Looking for a tasty smoothie to wash down your morning meatloaf? Check out my post-Low-Carb Smoothies & Shakes with 5 Net Carbs or Less. I’ve got gestational diabetes and your blog has been a lifesaver. I’ve been struggling with breakfast and getting so tired of plain bacon and eggs… not only is this something different, but I can make it ahead of time and heat it up throughout the week, which will make mornings SO much easier. Thank you!! I literally cried when I found your chicken divan recipe, because I realized it would be delicious and I could eat as much as I wanted. Your lemon cream sauce for chicken has also been a huge hit, even for my kids. Can’t say thank you enough! ChelseyCrouch Hurrah! I’m so glad I could help! And yes this recipe has been feeding me all week! Update: I made it today and it is amazing. I did double the eggs and had to bake it longer, but it’s delicious. Thank you! ChelseyCrouch Awesome! Glad you liked it! Just made a version of your Meazza recipe from The Wicked Good Ketogemic Diet Cookbook…my husband is in LOVE and says he mever wants pizza any other way U0001f60d!! Thank You! Can you clarify if the 682 calories is per slice or per pan? Hi, yes it’s per serving (4 fairly large servings — could go to 6 for kids). At least half the recipe is egg, but the sausage is what gives most of the flavor. This looks great. I am new to Keto lifestyle and wanted something new and different for breakfast. I love this. I am going to make it tonight and portion it of into some containers for a quick morning breakfast. Great idea. Thank you. This is definitely a “keeper” recipe. I’ve made it a couple of times now, most recently for a breakfast pot luck at the office – everyone loved it! Since I’m working out-of-pocket this week, I’m prepping all of my meals today. I just made this recipe in my muffin pan, and they came out perfect! I made 12 muffins and can choose to pack 2 or 3 with me each day depending on what other meals/snacks I pack. I used parchment paper to make impromptu muffin liners, as I never have them in the house, divided the cream cheese, cheddar and scallions evenly over the tops for the 2nd baking. I used a stoneware muffin pan and kept the baking times the same as in the original recipe. Thanks for sharing this awesome breakfast recipe! I’ve made this three times now each time a little differently, but each one is so good. I like to cook my sausage first then I don’t have to worry about the grease. I also use turkey sausage and have tried it with mozzarella and provolone cheese. Thank you for this wonderful recipe! Thanks for the clarification! I can’t wait to give it a try! Also, can you clarify the Chicken and Spinach Ricotta Crepes? It’s on page 182 of The Wicked Good Ketogenic Diet Cookbook. I think the publisher may have left out a step. Ah-Ha! Doi! Forehead smack! Thanks for clearing that one up, too. That makes two I can’t wait to try. I’ve been slowly cooking my way through your book, and every one has been a keeper. Particular favorites have been the Cheese Bomb Italian Meatballs, the Sage Sausage Scotch Eggs, and the Chicken Parmesan and Zoodles. I, too, have Italian heritage, and before I found your low-carb book, I was afraid my Italian relatives were gonna rub me out of the roll call. Haha, the Italian guilt trip is a real thing! In the breakfast Meatloaf recipe, you list ghee as an ingredient but nowhere in the directions do mention adding it…?? Hi, I have a question, the calorie count on the corrected recipe in the link above (56) is much higher than the recipe in the kindle book (682)…can you confirm? thanks! Do you cook the sausage and onions in a frying pan before adding it to the eggs and meatloaf pan? Or add sausage uncooked? Made this yesterday and it was wonderful! It’s even great reheated. I threw in some finely diced mushrooms (I had to use them up) and it was a great addition! Hi Patricia, if you follow the instructions here, it will come out perfectly, I’ve even included photos for every step of the way, and all the nutrition and servings are updated here. (Soupy is fine when you put it in, the eggs firm up).